u Srbiji ista u dinarima. Firmware 2.0, this improved firmware is used on Everest-D V5 and will also be available for V4 embossers. The secret behind a successful cut-sheet Braille embosser is the sheet feeder. The robust sheet feeder vouches for reliable Braille production and the feeding process of high quality Braille on both sides of the paper. Index Braille has purchased the rights to produce the only Braille optimized sheet-feeder in the Braille embosser market today, giving the Index embossers a considerable advantage over competitor sheet-fed embossers. This sheet-fed braille embosser continues to lead Braille on cut-sheet paper into the future alongside modern day ink printers. the usage of standard heavy office paper - this is more readily available as it is found in local supply stores and available for a fraction of the price compared to special braille paper. The Everest-D V5 supports a flexible range of paper sizes between 120-590 mm in length and 120-297 mm in width. For ideal braille embossing use booklet format with A3 or tabloid paper sizes. The sheet feeder holds approximately 70 sheets of heavy paper (160 g/m2). Having acquired the production rights for the sheet feeder in 2006, IndexBraille was given a unique opportunity. The sheet feeder has now been refined for braille production in every detail passing after user demands. The purchase of the sheet feeder for IndexBraille, has given the company the flexibility always dreamed of for the Everest sheet feeder. It is a top quality part of Index Braille Everest-D embossers that will be market leading for many years to come. As in any printer the standard print format is to print horizontally on the page to create a portrait style format. However, because of a concept we call Floating Dot Page (or Area) a number of print types and Braille output features have been more easily achievable because we are able to place Braille dots anywhere on the page and still maintain double-sided Braille. This method is a flexibility that no other braille embossers offer currently. 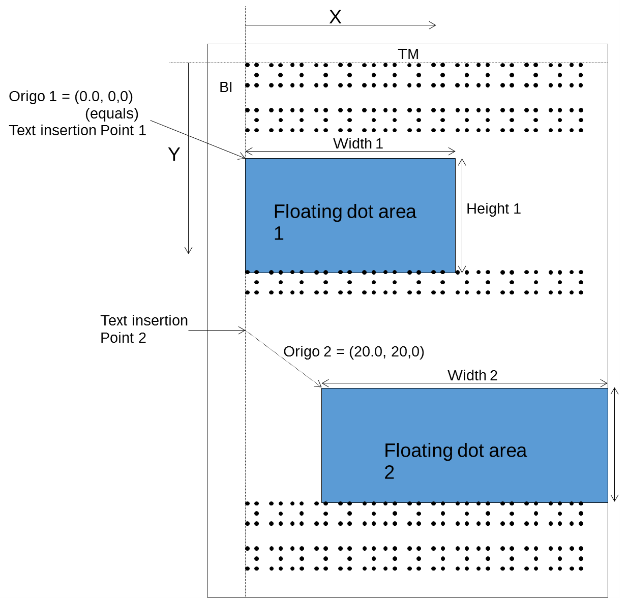 A floating dot area is a user defined area on a page that is composed of a set of braille dots. The floating dot area can either define an entire page or it can define a part of a page which can be interspersed among ordinary braille text. When embossing traditional double-sided braille the Floating Dot page automatically creates the Braille dots between one another on both sides of the page so that no two dots merge. The Everest-D V5 supports booklet format (saddle-stitch binding). This printing mode enables users to easily produce braille books and other lengthier documents. When printing in booklet format, the printer is loaded with A3 size paper (or Tabloid) and embosses vertically (or sideways) on the page in A4 (or Letter) size pages with a folding line down the center of the paper. 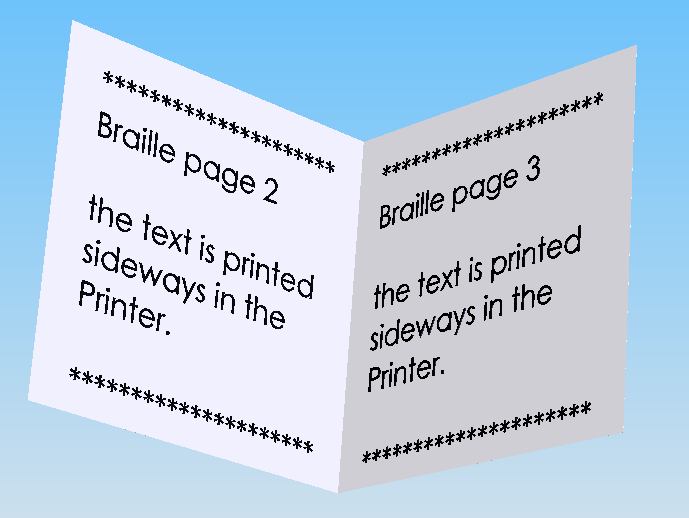 Each Braille page is automatically embossed in page order, once the document is completed users simply must fold along the folding line. When embossing graphics with an Index V5 embosser the Floating Dot Page concept with mixed text is supported. This means that you may create and emboss tactile graphics and text on the same page. The text is often useful to use as a description of the graphic(s) included. Today there are many different types of paper available which can create an extra challenge for creating Braille labels and thus parameters. However, when using the powerful technique; Esc-D format, you can temporarily define paper definitions to the paper and label sizes being used. 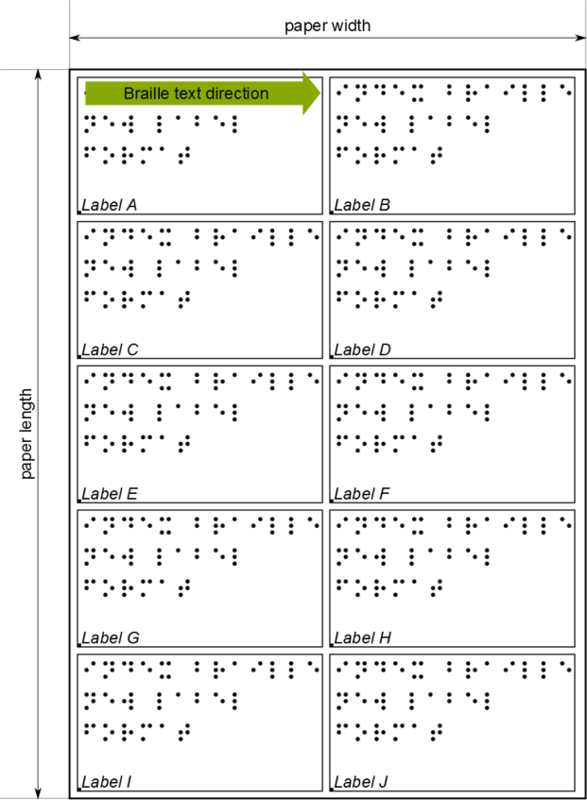 Braille labels can be embossed double-sided. the layout values define the same setting options as noted above in the distributor default settings and these may be adjust directly in the V5 embosser in the Standard or Advanced Wizard. The following LED lights are implemented on the Index V5 embossers to introduce and offer an even more clear user interface as well as to sharpen the Braille embossers design element.